November 27, 2015 By This post may contain affiliate links. 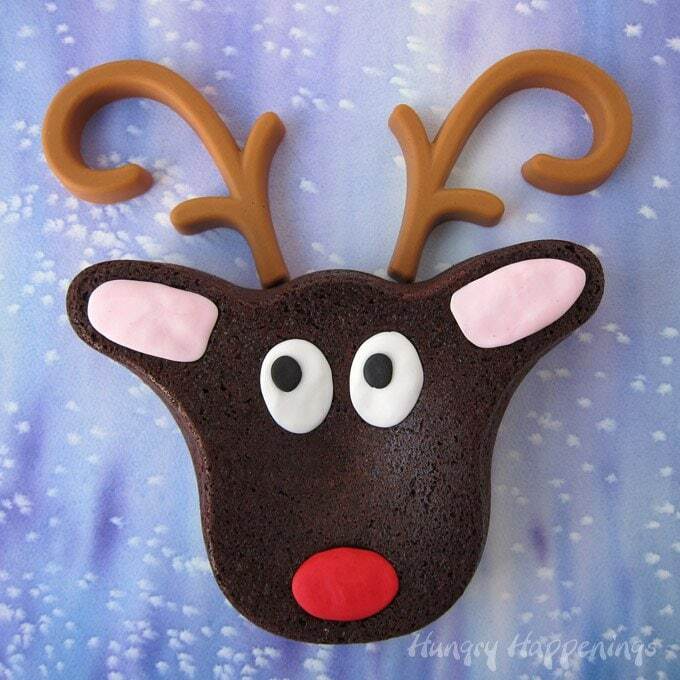 Turn your favorite brownie recipe or mix into an adorable reindeer for Christmas. It’s so easy to create this Brownie Rudolph with Peanut Butter Candy Antlers using a new cake pan and silicone mold kit from Wilton. Isn’t this Rudolph simply adorable? I have to admit that I had very little to do with making him so cute. I simply baked a brownie in a reindeer shaped cake pan and decorated it using the pan as a guide. The antlers are perfectly shaped peanut butter candy created in a silicone mold. The pan and silicone mold come together in a new kit from Wilton. Never before have I seen a metal cake pan sold with a silicone mold. It’s such a cool concept. Reindeer have large heads with long, thin antlers which makes creating a cake pan that’s all one piece a bit tricky. Usually the area around the antlers is thick and you have to pipe frosting on to create the antlers then have to pipe on a background around the antlers. With this new kit, you make the antlers separate from the head, so they are perfectly shaped. You could create them out of brownie or cake, but they would be a bit fragile, so Wilton suggests making chocolate antlers. Being I chose to make Rudolph’s head out of a deep dark brownie, I wanted my antlers to be lighter in color and chose to make them out of Peanut Butter Candy melts. To make a brownie Rudolph, simply spray your reindeer pan with baking spray, then whip up your favorite brownie mix or recipe, pour 2 -2 1/2 cups of batter into the pan, and bake it for 44-48 minutes. While the brownie is cooling, melt 4 ounces of Peanut Butter Candy Melts, and pipe or spoon it into a silicone mold. Pop the mold in the freezer for 20 minutes, remove and peel the mold away from the candy antlers. 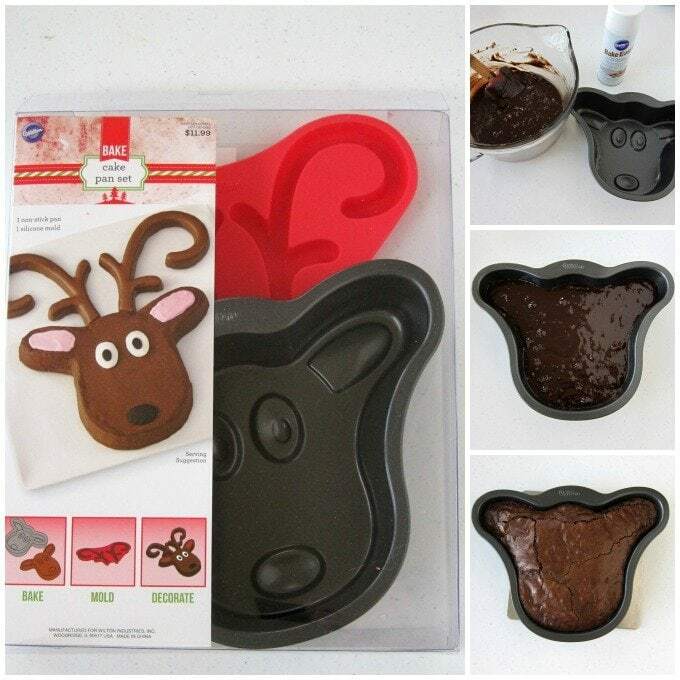 To decorate the reindeer with fondant, use the cooled baking pan as a mold. Simply pinch off two small pieces of white fondant, roll into balls, then press into the baking pan to create two eyes. Pinch off two really small pieces of black fondant and roll and flatten into two small ovals for the pupils. Attach the pupils to the whites of the eyes using a dab of water. Pinch off pieces of pink fondant and press into the ears, and a red piece into the nose. Using the pan as a guide, you get perfectly shape facial features. Allow them to dry for at least 15 minutes, before removing them from the pan, then set on the brownie. 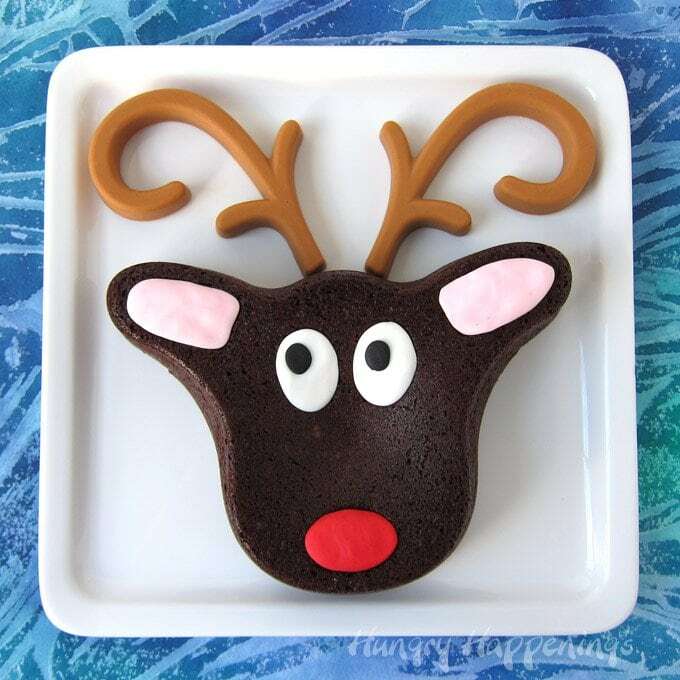 To serve the Brownie Rudolph, place on a serving plate and set the antlers in place. If you want one of these pans to make your own Brownie Rudolph, you’ll need to head to Target this season to pick one up. As a brand ambassador for Wilton, I receive compensation and free products in exchange for creating projects to share with you. I really love this new reindeer cake pan kit and will definitely use it for many holidays to come. 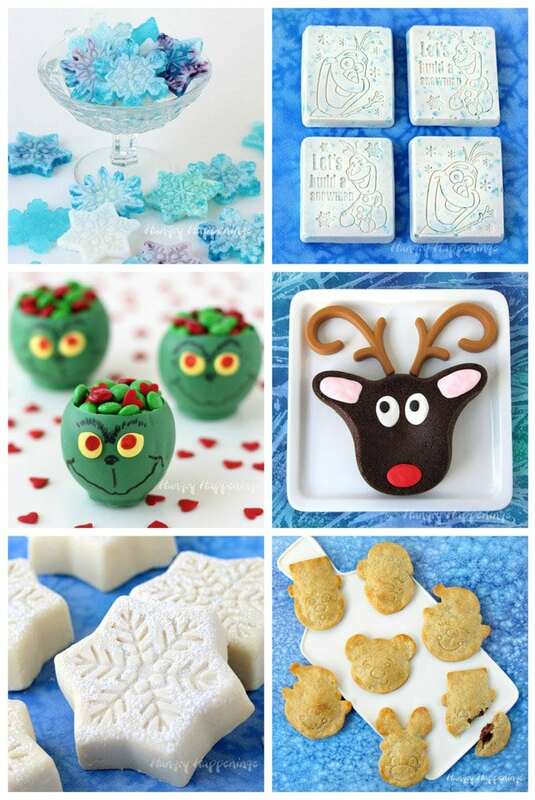 If you are looking for more simple food crafts to create for Christmas, check out these other fun treats. I commented on the cute grinch candy cups. I commented on the Kit Kat Christmas trees. They were already cute, but putting them all upright on the long serving dish like a forest took it over the top in cuteness!! That is so cute! Doesn’t look too hard to make. I am wondering how easy it is to get the antlers out of the mold without breaking. I was worried about getting the antlers out too, but the mold peeled right off the candy. I had no trouble and they looked great. I commented on the grinch cups! They are too cute! posted on the polar bear post. You can find the pans at Michael’s and I also saw them at Target. I love the combo of pan and silicone mold and agree they need to make more! Good luck finding one. I just was told by Wilton that this pan is only available at Target. Sorry for the misinformation! I saw a few at my Target yesterday. Oh my goodness Beth, this is adorable and now must have this set! You know I love everything you do! I’m sure you will make the most amazing cookies using your new set. Ok this is way to cute! Pinning for later!